Isolation 1-Channel high-power relay control module, select the high signal trigger, only need 3mA current can drive control capability of 30A relay pull. 4, CH1: relay control interface, high level (relative to VERF) corresponding relay pull. Note: the isolated relay module in order to adapt to the electromagnetic environment is relatively poor or relatively high signal requirements of the occasion, if you want to achieve a complete isolation effect, the user control panel power supply (that is connected to the VERF reference power) and the relay module power supply (DC + / DC-) should be separated, if the two power supply shared ground, then the effect is not fully isolated, then the user can use the standard relay module. 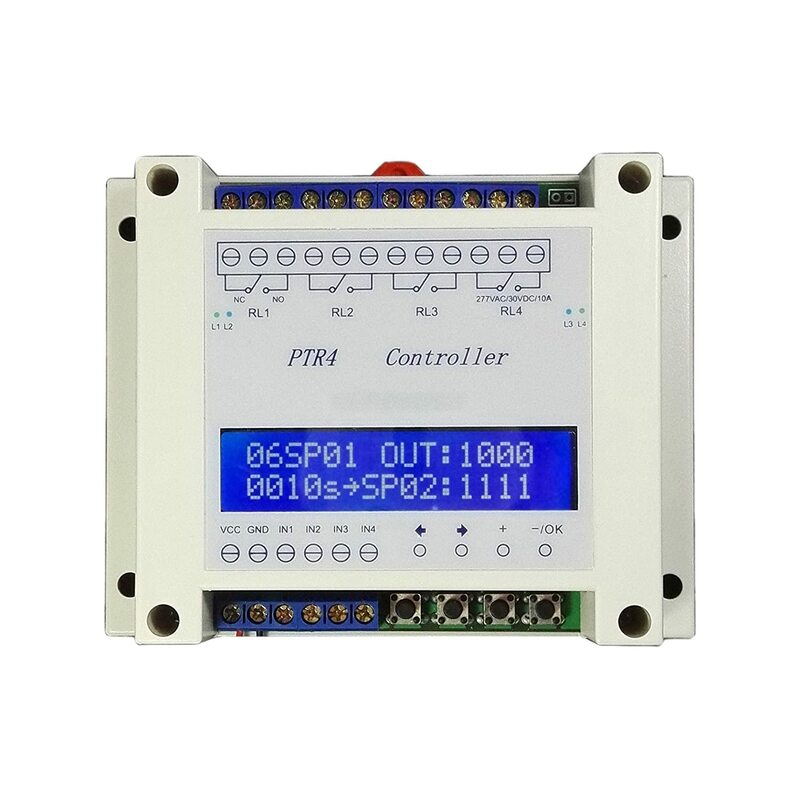 The PTR4-SP controller can be set 99 groups time (steps), each step the relay switch state can be set switch “ON/OFF” (close or open) , use external input voltage signal or switch it can achieve many functions. The controller can be used to control four solenoid valve – linkage, sequence control as PLC, etc. Industrial LCD displays, set by buttons, easy to use, has reset function.High-performance microcontrollers, industrial-grade reliability, high process stability, low power, reverse power protection function, avoiding surge current shock. Industrial LCD displays, set by buttons, easy to use, has reset function. High-performance microcontrollers, industrial-grade reliability, high process stability, low power, reverse power protection function, avoiding surge current shock. Shell size 115*90*40mm. All settings can be saved. Please read the user manual carefully before using it. If you nedd the soft and C++ code to control this device, just contact us on amazon! The module uses HID technology, without any drivers, plug and play. Support WIN7/XP 32/64-bit systems, easy to use and simple. 5V relay, the relay can control the maximum 250V 10A AC load and 30V 10A DC load. Reserved 4, 8-way power interface, connected to power, even if the computer off or unplug the USB from the computer, you can also relay remains set. 1-way and 2-way no power connector. Onboard square USB interface connection stable. High-performance USB controller chip, military grade PCB board production. Control terminals Connection: NC / COM / NO. Voltage: DC 5V Load: 250V 10A AC / DC 30V 10A Max . Mounting holes center distance: 52.2mm * 36.6mm. Support System: WIN7 / XP 32/64 bit systems. The module uses HID technology, without any drivers, plug and play. Support WIN7/XP 32/64-bit systems, easy to use and simple. Thank you for your choose!